Tanzania’s authorities promised to “not spare anyone” as they began investigations into how almost 200 people died, including 50 children, when an overloaded ferry capsized near Zanzibar. Helicopters, rescue boats and scuba divers continued to search for survivors in the waters off the island on Sunday, as three days of official mourning began. Some 619 people had already been found alive. Many had hung on to floating wreckage through the night. 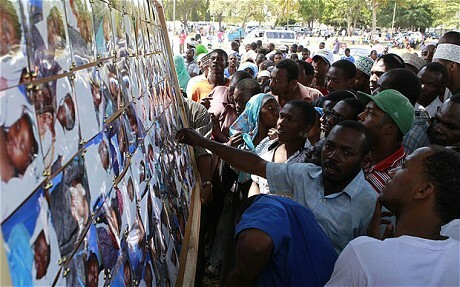 But officials said that hopes of finding more survivors from what is Zanzibar’s worst maritime accident were fading. At least 197 people died. Mohamed Aboud Mohamed, the island’s minister of state, said that investigations were focused on why a ship licensed to carry 600 people was allegedly carrying more than 800. Heavy loads, including vehicles, building materials and cement, were also taken aboard the MV Spice Islander before it left Tanzania’s main city, Dar es Salaam, late on Friday, bound for Zanzibar. Some passengers realised they were in danger as the ferry started to tilt while still in the port and tried to get off. A few succeeded before the crew pulled up the ladders so the ship could depart.